Delicious! And amazing photos! I reblogged it! I love scallops and I love bacon so this sounds heavenly. I will definitely have to try this. 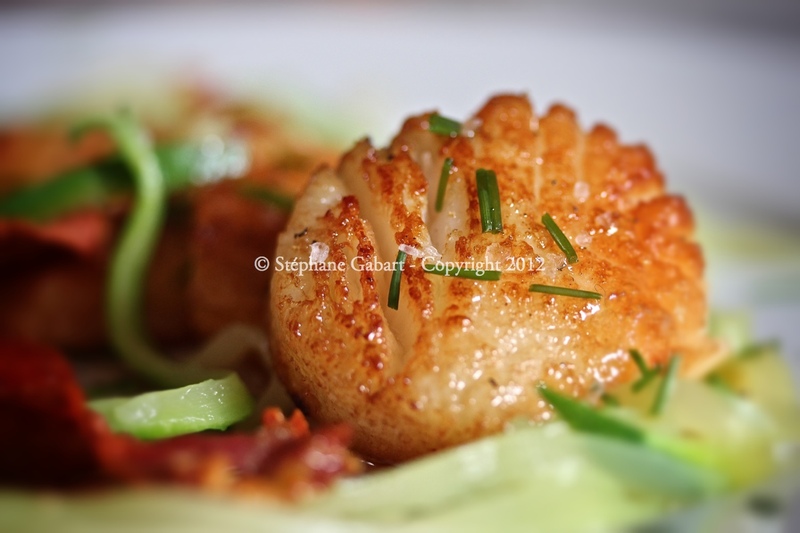 Also, the food photography is fantastic! Elles sont très appétissante ces coquilles saint-Jacques un vrais régal . Bonne journée Jacques . Très rapide à faire aussi. Merci pour ton commentaire Jacques! I love both scallops and bacon!! Beautiful images. 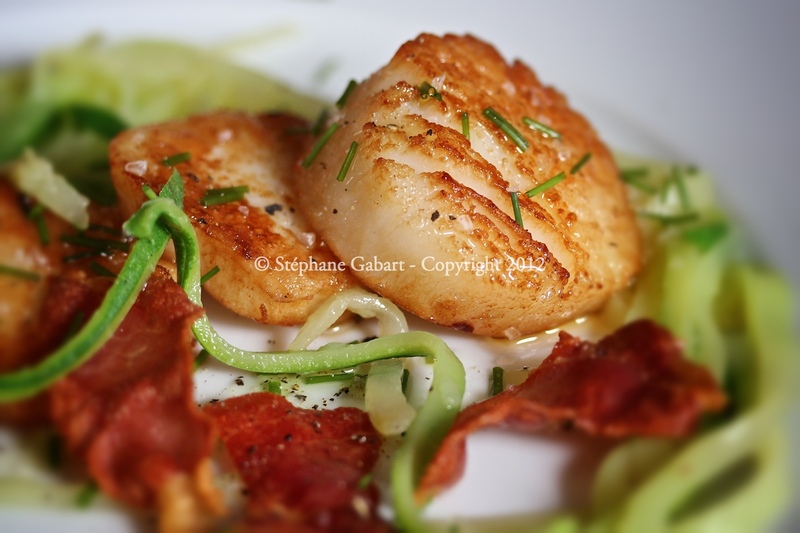 I love scallops and bacon, especially together. 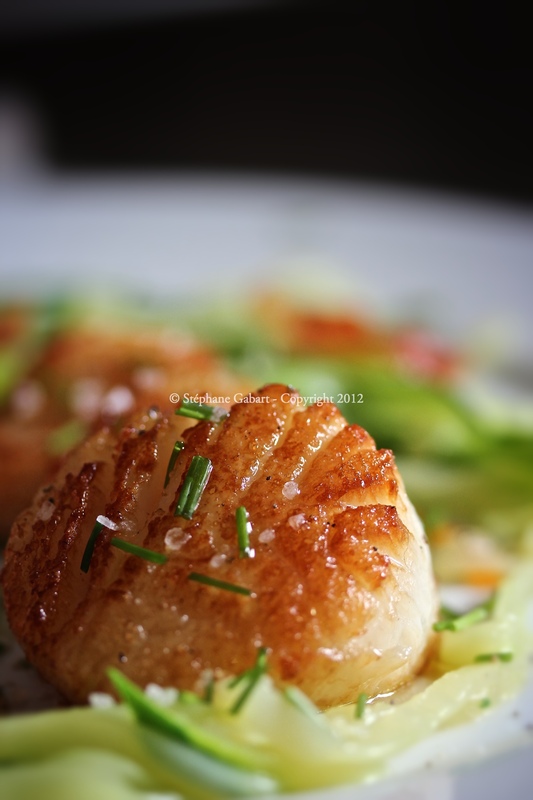 Very nice … did you score the surface of the scallops or is that just an artifact from the frying? It is from the frying! I think that’s the best part:0) It does it less if you use butter. I guess the temperature of the oil rises higher and chocks the mussel more/better… Also, I find that the color is more uniform than with butter and it’s probably healthier as well. How do you say fancy in french? …You are too fancy for me. This is fancy food I live for! Thank you for the kind words, but nothing fancy here. Less than 5€ in produce and less than 5 minutes to prep:0) You know I had triple heart bypass surgery last year. I REFUSE to eat bad food now! Every single bite matters:0) Thank you so much for visiting my blog. I am starting a game on the blog tomorrow and the prize will be a 3 night stay at my B&B. I hope you enter the contest! C’est adorable! En fait, moi, quand je ne sais pas quoi dire, c’est souvent parce que j’ai la bouche pleine:0) Merci encore pour venir si souvent!! !